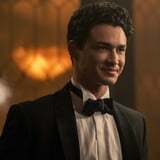 Overall, their split ends up being for the best: Harvey moves onto a romance with Sabrina's BFF, Ros (Jaz Sinclair), who actually ends up being a far better fit with him, leaving Sabrina free to pursue a relationship with Nick. He's clearly smitten with her from the get-go, and consistently supports her through all the ups and downs she experiences now that she's signed the Dark Lord's book and enrolled full-time at the Academy. From making sure Sabrina feels safe and secure when the students are forced to participate in a lusty tradition that she's not quite ready for, to helping her prep for a competition to be Father Blackwood's "top boy," Nick is there for her no matter what. Satan ends up arriving in Greendale in his "fallen angel" form (aka a hot, shirtless British dude) and demands that Sabrina join him as his daughter-queen (sure, not weird at all). When she refuses, he baits her with a number of revelations, including that he was the one who told Nick to get close to her; their relationship was actually a sham. Sabrina is rightly furious, but Nick desperately tries to explain that although the Dark Lord asked him to influence Sabrina and keep her on the path of night, his feelings for her are real. That's why he decides to put his money where his mouth is and make the ultimate sacrifice.